After an amazing start to the year, 2SO are now looking forward to their new learning adventure...Queen Victoria's Reign! Over the next half-term, we will be helping Queen Victoria with some big problems and finding out about other important people from this time period. This week the children received a very important e-mail from Queen Victoria herself! She was in a bit of a pickle as her handmaid had made her some brand new knickers but... she's lost them! Queen Victoria asked for the children's help in designing and creating her a pair of brand new knickers! The children explored different materials to choose which one would be make the most comfortable pair. They then thought about what patterns the Queen might like on her brand new knickers! This half-term we have been focusing lots on how to stay healthy. In science this week, 2SO have experimented to discover how germs spread and how far a sneeze can travel! The children filled up spray bottles with paint and water to use as their 'sneeze'. Once outside, they 'sneezed' using the bottle and measured how far the liquid travelled. After this we brought the experiment back inside and used hair gel to represent the germs that can be found on our hands. The children high-fived around the circle to find out how far the 'germs' would spread! This week the children have had so much fun turning our classroom into a Victorian School! They have been learning all about life in the Victorian times and how much it has changed compared to our lives today. The children had the opportunity to dress up in Victorian clothing and explore a few everyday objects from the Victorian times... including some finger stocks! Today we had a wonderful visitor to 2SO. 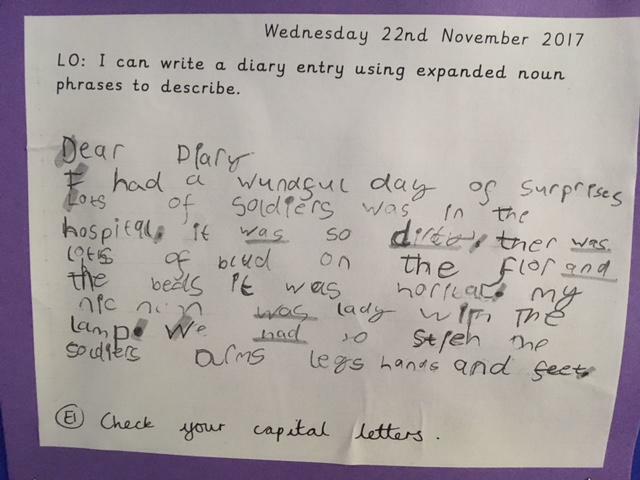 Florence Nightingale came to teach us all about how she cared for the soldiers in the war during the Victorian times. 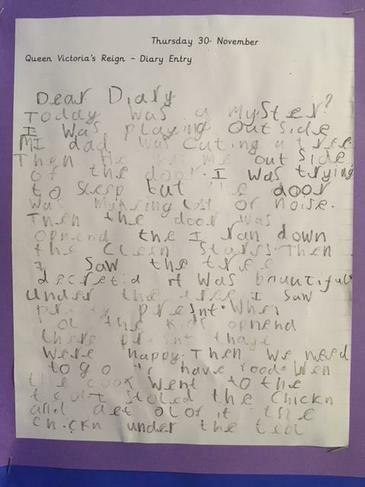 The children got to see the clothes that she wore and learnt all about the terrible conditions of Victorian hospitals before Florence Nightingale changed them. 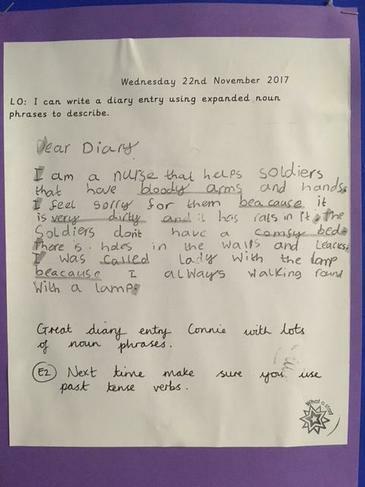 After Florence's visit, the children wrote a diary entry from her point of view to explain how it must have felt to be a nurse during this time. A Victorian Night Before Christmas! WOW! The children were absolutely FANTASTIC in their Victorian Night Before Christmas show. They have worked so hard over the last few weeks and it really shone through on stage. I am so proud of them, as I am sure you all are too! It was wonderful to see so many of you coming to watch the children in their show and joining in with our Victorian tea party! We hope you enjoyed our Victorian Sponge cake! Thank you all again for your continued support and all of your contributions during this half-term. It is greatly appreciated!